Tall Emu CRM is designed to not only do the basics out of the box, but be completely customizable. Regardless of the marketing channel you use, you need one central place to manage, send and store this activity. Tall Emu CRM helps your quoting and selling - in the office, in the field, at point of sale and on the web. Keep track of your business with Tall Emu CRM's reporting, KPI Management and dashboarding solutions. Set, measure and report on targets over every area of your business. Wasting time and money with manual processes? Tall Emu CRM can help with the back-office too, to help streamline operations processes. Create projects and the tasks, then assigned and add the allotted time frames. Tall Emu CRM can help manage all aspects of Product Management in a way that matches your business needs and the type of product you are selling. For business that need to buy in products or raw material for the use in final products that they go on to sell, then we have section of the Tall Emu CRM that manage this element. Having your manufacturing unit connected to the rest of the business is important because what you sell and at what price is affected by cost and production of manufactured goods. The Assets management function in Tall Emu CRM allows you to log information about your customer’s assets and track work order history on the asset. Tall Emu’s Stock Management system extends the basic features found in your accounting system to offer the business capabilities you need. The Hire Module will allow you to run and manage the backend of your Hire or leasing business. Tall Emu CRM now contains a shipments module that is used to track and manage goods going from one place to another. By integrating to leading courier providers we enable you to have the Sales data flow through to the fulfilment & dispatch part of your business. Tall Emu CRM connects with many popular accounting systems to avoid double-entry of data and maximise accuracy. Bank feeds are available from all major Australian banks. Copyright in the Material on this Web Site is owned or licensed by Tall Emu Pty Ltd.
Our powerful CRM solution acts more like an ERP – not only does it increase the profitability of your business, but it streamlines the lifecycle processes in your marketing, sales, accounting, and service divisions. It’s possible to have your website send webform data or shopping cart sales directly to your CRM; automatically. You can also have product data, pricing levels from CRM published up to the web. We remove redundant data entry and we can even send completed sales to your accounting systems. In addition we can show you how people found you so that you can have full lead and sale attribution reporting so you’ll know where to spend your marketing dollars. Our powerful automation tools let you schedule rule-based follow up of your sales leads, including emails sent directly to the lead on a drip-feed, or reminding your sales team to follow up (inlcuding automatically scheduling calls). Automate proposal & quote creation in MS Word mail merge – dynamically populated Word proposals. Writing proposals is a tedious task so it makes sense to create a template and change the bits that are relevant to the sales opportunity and customer’s needs. The faster you get back to prospective clients, the more likely your quote is to be accepted. Tall Emu CRM streamlines the quoting process, and if you are currently quoting based on formulas in Excel spreadsheets we can streamline this and make it go away. You can even track when someone starts looking at a quote – perfect for long sales cycles. If re-keying of data between databases, excel spreadshets and your accounting system cause inefficiencies in your business, Tall Emu CRM can help. We link with Australian banks and all major Australian accounting companies to eliminate the re-keying of data. Our powerful CRM solution includes automated invoice reminders sent from your CRM directly to your clients. Asking people to pay their account works – take this repetitive task away from your team and have the system do it for you, saving time and money and ensuring it is done. Only by taking an honest look, and truely understanding the real data from your business processes can you find genuine opportunities to implement improvements to your business lifecycle. 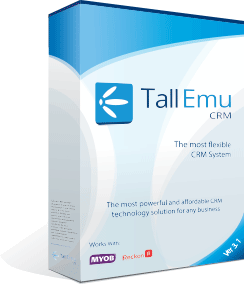 How can Tall Emu CRM help your business grow? With a CRM this powerful, we’re with you every step of the way. From the onboarding process to premium support for your organization, we want you to get the most out of your new CRM. Copyright © 2018 - 2019 - Tall Emu Pty Ltd.